Grant Shirley, Quality Systems Manager , Stratasys Direct Manufacturing Inc.
Grant Shirley serves as Quality Systems Manager at Stratasys Direct Manufacturing Inc. In this role he is responsible for assuring quality products and process through implementation and maintenance of quality standards, procedures, and specifications. Grant leads continuous process improvements and supports a customer-focused culture by enforcing company quality standards with special regard to customer requirements, customer satisfaction, product accuracy, and on-time deliveries. 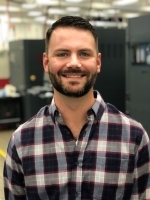 Grant joined Stratasys Direct in 2008 and has performed many roles over the past 10 years including Quality Engineer, Quality Specialist, Inspector, and RP Technician. While at Stratasys Direct, Grant earned his AS9100 40-Hour Lead Auditor Certification and Six Sigma Green Belt Certification (CSSGB).